The word htut as a verb means to pile up/repeat one after another. The same idea is applied in the floor levels of the building. In the word "chout htut" meaning sixth floor, htut is used as a numerical classifier for the number of floors. choat-htut-ji3 pfa1-ya3 (noun) is the pagoda having six floors, and a tourist destination in Yangon. To get married in Burmese means to htut the hands where the couple place the hands on top of each other inside the silver cup while sitting side by side on the stage in the wedding ceremony. The phrase Let htut ja1 meare2 means we will get married, where Let htut is the verb to get married. In the phrase htut pyau3 ba2 ome3, "htut" is used as an adverb meaning again. It is a request to repeat what has been said, where pyau3 means to say or to tell. The same word "htut" is used as an adverb meaning again when offering an another round of meal. htut ta1-leare3-leare3 means having to repeat something unpleasant again and again as in htut ta1-leare3-leare3 pyau3 nay2 yah1 deare2. Usage: How many times have I told you not to do this? htut ta1-leare3-leare3 pyau3 nay2 yah1 deare2 -- I have to be repeating this again and again! In the old days, and still in many government offices, people htut (verb) the registration books. That means there is a stack of registration books where you place your book and wait for your turn for processing. sa2-oat htut hta3 deare2 means I have already submitted my registration sa2-oat (book). htut ta1-ya2 refers to Roti Parata (round Indian pastry having many puffy layers) where ta1-ya2 means one hundred. So, htut ta1-ya2 means one hundred layers. It must have been half a year since I last updated my lessons. It seems like time just flies like the wind unseen. 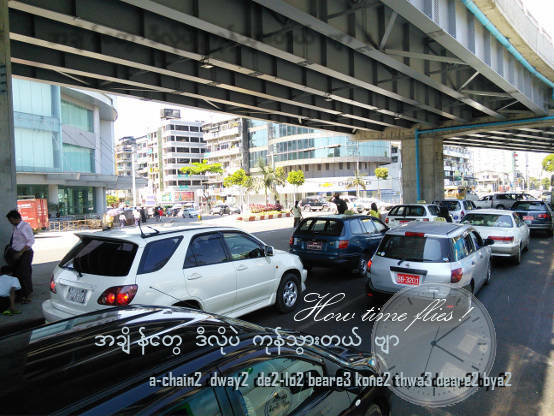 In Burmese, a-chain2 means time. The English word "time" is usually singular, such as in "time stands still". But, you can also say "times are bad", or use it to mean frequency as in "I have done it three times." Likewise, the word dway2 is added in Burmese to make the word "time" plural. Who would have thought Father Time can be Plural (dway2)? a-chain2 dway2 de2-lo2 beare3 kone2 thwa3 deare2 bya2 -- Time just flies by in my life. (uttered by the male person). You can use the above phrase to describe the meaningless life without a purpose, without concrete results. (Be sure to look sad when you say that phrase like an actor on the stage.) You can also use that phrase to describe the wasted time in the traffic jam. How would a female person say that phrase? You can replace bya2 with the female term shin1. But, more animated and energetic word is tau2. a-chain2 dway2 de2-lo2 beare3 kone2 thwa3 deare2 tau2 -- Time just flies by in my life. (uttered by female person). In English, you add "s" or "es" to make many words (you can count) plural as in "mangoes", "oranges", "cars" and so on. But then, the plural of "this man" becomes "those men". You don't say "peoples" but "many people". You don't put "sugars" but "some sugar". In Burmese, you can make most nouns plural by adding dway2. Similar word mya3 is used in the written language. However, nobody will use mya3 as a plural word in spoken Burmese. Although it is possible to have spoken phrases with mya3 right after the noun, it does not modify the noun to the plural word. For instance, "mya3" in "a-loat mya3 nay2 deare2" means I have "many" a-loat (work) to do as opposed to "a few" (neare3). It should be noted that mya3 in the above Burmese sentence is a verb, "be abundant", but if you translate into English sentence, it is equivalent to adjective "many". You can say: a-loat dway2 mya3 nay2 deare2 -- I am busy. The plural dway2 can be omitted. ha1 -- emphasis particle equivalent to exclamation "Gosh! ", "Oh, my God!" lu2 dway2 a-mya3 ji3 beare3 ha1 -- Gosh! there are so many people! Myanmar Grammar Notes: Burmese language does not recognize ah2-may2-date (interjection) at the end of the sentence. The word ha1 can be an interjection if it appears in the beginning of the sentence. There are exceptions to dway2 usage. You can say, "water has leaked in" by adding plural dway2 to water, but you don't say, "please drink water dway2". There are no hard and fast rules as to when you can add that plural word. In my analysis, there is no dway2 in "please drink water" because you are referring to a single glass of water. ha1 -- exclamation as in "Gosh! ", "Oh, my God!" yay2 dway2 win2 la2 byi2 ha1 -- Oh, my God! Water has leaked in!" In Myanmar Language, the word water (yay2) can be used as either Singular or Plural term. It can be used as plural by adding the suffix (dway2) as this video clip shows. a-ba1 -- to address the elder man (old man)"
yay2 thout ba2 ome3 a-ba1 -- Grandpa, won't you have some water? Nobody will say, "yay2 dway2 thout ba2 ome3 a-ba1", just like nobody will say, "Please drink many waters" in English. hta1-min3 htut hteare1 ba2 ome3 -- Won't you have some more rice? (Please refer to the detail explanation of htut in the left column. Why is dway2 missing? That's probably because each person has his or her meal using only a single plate. Let's analyze some more. You can say, "I have bought apple dway2", but you offer the apple in singular form because you don't expect someone to bite 2 apples (or 2 pieces) at the same time. Think of it this way. You can add plural to the clothing items such as "shirts", but you ask someone to put on the shirt. hta3 -- modifies the verb "to buy" to "has bought"
pan3-thi3 dway2 weare2 hta3 deare2 -- I have bought some apples. pan3-thi3 sa3 ba2 ome3 -- Won't you have some apples? yah1 -- particle: "need to do"
meare2 -- going to; future tense or intention. hsun2 weare2 yah1 ome3 meare2 -- I/We need to buy rice. Again, dway2 is missing probably because people usually buy one bag and one variety of rice at a time. If you put dway2, you know right away it does not sound right. However, when someone says "that shop is selling rice dway2" it becomes plausible; only linguists and Burmese language teachers will argue among themselves whether it is a correct Burmese or not. The above hypothetical sentence has a tone of surprise in it. That's what you would tell someone if you unexpectedly discovered that the shop over there is selling rice. If you just want to tell someone that rice is available at that shop, you normally say it in the singular form. Ho2 hsine2 hma2 hsun2 youn3 deare2 -- Rice is available at that shop (or) You can buy rice over there. For example, you can say someone is tha1-bau3 dway2 kja1 nay2 deare2 as he is looking at the latest car model in the showroom. Try to imagine him with eyes wide-open, smiling with excitement, going around the shiny new sports car several times, touching it, looking at it from different angles, and wanting it. vegetable(s) in general term, but not to specific names such as "cabbage", "bean-sprouts", etc.. In Burmese, you say "bean-sprouts" without (s). all professionals such as teachers, police, workers, etc. food & drinks: meat, fish, rice, eggs, milk, sugar, water, all types of beverages. items that you use or consume one at a time: medicine, clothing when the conversation is about such usage or consumption. items that come in a lot, a pile, or a bunch: a bunch of banana, a bag of rice. I have already explained in lesson 4 the word doh1 which can make you (one person) to you people, he to them, and I to we. So, doh1 can make singular to plural for 1st person, 2nd person, and 3rd person. There is no English equivalent that can make "he" to "he(s)". doh1 and dway2 are not interchangeable, but dway2 can be added after doh1 to make a stronger unity as a whole. In written Burmese Language, the plural word mya3 is never used after doh1. In lesson 2, I have already given sufficient examples using ja1. Unlike dway2, which modifies the noun (such as apple) to plural, ja1 modifies the verb (e.g. to eat, to go, to play, to review) to plural just like the heading of this section: You (doh1) better review (ja1). The English equivalent would be like changing the verbs "does" to "do", "goes" to "go", "eats" to "eat", and so on. Example: sa3 ja1 zo1 in English is "Let's eat", not "Let's eats". Since verbs are action words, ja1 is applicable to all beings including animals capable of actions. If something happens to plants or inanimate things like clothes and books, there is an another word attached after the the verb to indicate whatever happened to those things. byi2 - ending word to show that some condition has reached. a-woot dway2 yay2-hso2 kone2 ba2 byi2 - OMG, the clothes are getting wet! Note there there are two plural makers in the above sentence. The first particle dway2 shows the plurality of the noun. The second particle kone2 not only shows that getting wet is plural, it also gives the sense of totality 'all' and 'everything'. tha1-kho3 dway2 pyay3 kone2 byi2 - Thieves are running away! 2013 is an incredible year with lots of rain dway2, wind dway2, and flood dway2 not only in Yangon, but also in other parts of the World such as Southern Alberta and Toronto in Canada, London, and Paris. Rain can be catastrophic. But then, sometimes it is a pleasant surprise like a song that was requested. Don't worry too much whether or not to add dway2. Even Burmese people don't know which is right all the time. I will end this lesson with a song in my childhood. sa1-nay2 hma2 ywa2 teare1 mo3 lo2 beare3 theare3-theare3 meare3-meare3 chit meare2 la3 -- Will you love me passionately, like the rain that falls on Saturday?